Some of you are aware that I am looking for new decorating ideas for my new house. I love the decor in my current house but I feel like it’s time to change things up. I, of course, decorate with a heavy Disney hand at times and I feel like the bathroom is an easy place to do that without scaring off those new neighbours. 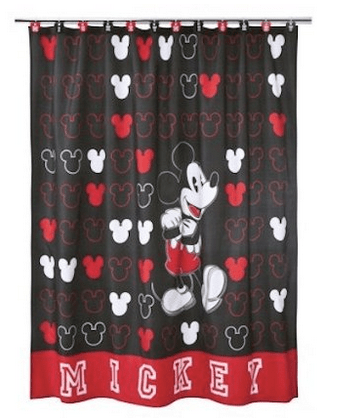 Today, I am admiring a new Disney discovery, the Mickey fabric shower curtain. I am loving the classic Mickey colors or red, black and white. I love the fact that it has Mickey heads as well as a full on Mickey posing proudly. I think the “Mickey” written along the bottom is adorable on the red. Everything about this makes me smile. I can envision a bathroom done in these colors. The size is 72 x 72 and the fact that it is fabric, and therefore machine washable, makes it even more appealing. It is on sale for $16.99 from $34.99 which is kind of the icing on the cake, If you like it, you can check it out here, for more details. Now, any shower curtain is going to need to be hung and that’s where the next find comes in. 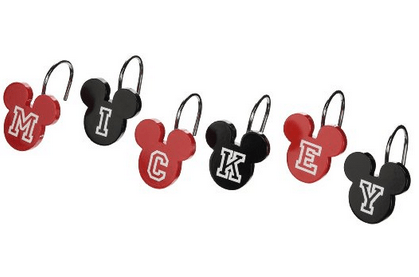 These Mickey shower curtain hangers are the perfect match to the shower curtain! They even spell out Mickey in the same font as the bottom of the shower curtain. These are on sale for $10.04 (weird price, I know) and can be found here. I think I may have found the theme for one new room in the new house! What do you think? Should I go for it? Let me know in the comment box below. Limited Edition Monorail Tee Shirt Available Till The End Of The Week!